Description: Adds a new item and recipe (unlocked with Automated Construction technology) - "Upgrade Planner" - that allows to replace entities on the map using construction robots. It looks like deconstruction planner (except it is yellow instead of red) and works in similar way: you can mark an area and entities in this area will be upgraded (or downgraded) to different entities, according to your configuration. Recipes set in Assembling Machines are preserved while upgrading. Since version 1.0.1 multiple rulesets may be stored and restored, so you can easily switch between them. More info below. Since version 1.1.3 you can use Upgrade Planner for selective deconstruction. Set an item you want to be deconstructed in the left column of setup and click with deconstruction planner in your hand on a button in the right column. Items marked this way will be removed and not replaced with anything. Mod has been inspired by this post on reddit. Before using upgrade planner, you must configure it using button displayed in top-left corner on the screen (button will appear once you discover Automated Construction technology). Configuration is explained below. To setup a rule in this GUI simply click on the button with item of your choice in your hand. If something is wrong (for example you tried to upgrade item that is not upgradable), a message explaining details of the problem will appear on top of the window. You can set any upgrade rule (like Assembling Machine 1 to Assembling Machine 3, even Assembling Machine 3 to Assembling Machine 2 if you want to downgrade), the only condition is that both entites must be the same type (you can't upgrade Assembling Machine to Smart Inserter). 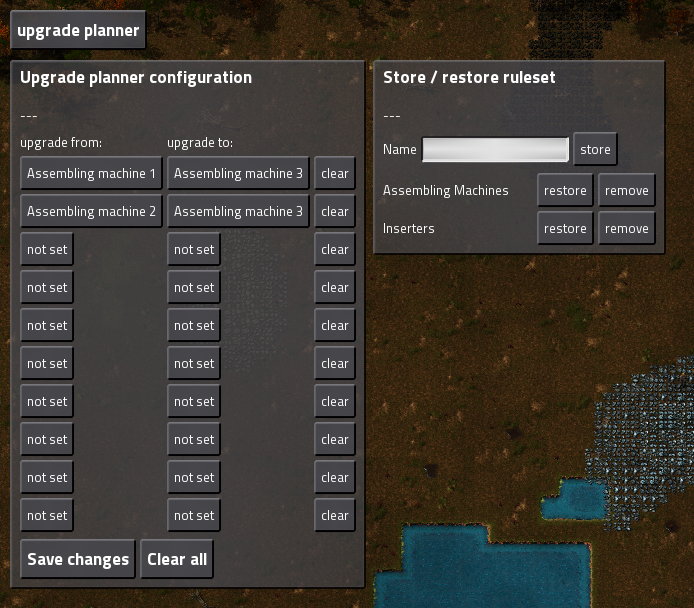 If you put a Deconstruction Planner in the right column instead of an item, robots will deconstruct selected item without replacing it with anything. This way you can use Upgrade Planner to selectively deconstruct items. Note: Some mods may provide items of same type with different size (like bigger or smaller Assembling Machines, for example). I don't recommend using automated replacing with these items, results may be unpredictable. If you made some changes and you want to discard them, simply click on button in top-left corner again. Window will disappear and all changes will be reverted. Since version 1.0.1 multiple (up to 12) rulesets may be stored in the storage. To store ruleset simply type its name into text field (names must be unique - if you try to store two rulesets with the same name, an error message will be displayed on top of the frame) and click "store" button: ruleset will be added to the list. You can restore it any time you want by clicking "restore" button next to its name on the list. Of course, you may remove any ruleset as well. Note: After restoring a ruleset from the storage, you have to click "save changes" button. If you need more than 12 rulesets in the storage, you can modify control.lua file of this mod. Maximum number of available rulesets is stored in MAX_STORAGE_SIZE variable at the beginning of this file. Just remember that if you add too many rulesets to the storage, table may not fit on your screen! Fixed potential conflicts with other mods that add some kind of custom deconstruction planner. Last edited by kds71 on Fri Feb 12, 2016 12:05 pm, edited 23 times in total. I've really missed this mod when I started a new game on 0.12, it's so convenient. I am getting an error when I load a saved game after enabling the mod. cannot execute command. Error: [string "for _, player in ipairs(game.players) do ..."]:3: LuaForce doesn't contain key resetrecipies. Also the UI button does not show up. I tried some other saved games and go the UI button to appear but had the same text error. P.S. Brilliant MOD. Oh how I missed it. khozmo wrote: I am getting an error when I load a saved game after enabling the mod. My bad, I forgot to update migrations script. I fixed in v1.1.2 of this mod. HAZZAH!!!! No error and the UI button is there. API call when LauItemStack was invalid. I currently have nothing set in the upgrade planner. After the notice it drops you back to the main menu. Please name your mod zip file/folder the same name as your mod title on the forum.! so it can be more conveniently found if someone needs to update their mod or find it again. A lot of mod devs are doing this, and it's a bit annoying. New feature in v1.1.3: You can now use Upgrade Planner to selectively deconstruct items. Just set an item in the left column ("from") and put a Deconstruction Planner in the right column ("to"). Now when you use Upgrade Planner robots will deconstruct selected items without replacing them. This was a bug related to changes in handling cursor stack in Factorio v0.12, I fixed it in v1.1.3 of this mod. Anyway, you are not supposed to click on the buttons with nothing in your hand - you should have an item you want to replace / replace with equipped. Version 1.1.4 released - I fixed a bug that would make impossible to select some items for upgrade / deconstruction in the planner configuration. Hopefully everyone should switch from my unofficial update to yours.. Selective deconstruction is awesome ! Found a small bug, not bad if you patient for the bots. 1. If you select something with upgrade planner, wait till blueprints show up, it will clear the blueprint if you select with the upgrade planner again. Hm it shouldn't be hard to fix, I could just disallow planner from cleaning ghosts. There might be some complications though, I will have to think about it. I'm trying this mod, but I can't find the "Upgrade planner" button to open the GUI. I'm playing on my own dedicated server, I have the yellow blueprint in my belt, I see buttons from other mods. Any advice? Have you tried saving and reloading the game? Several times. I've even tried to load my save in sigleplayer. Hm perhaps there is a conflict with some other mod, you have plenty of them. I will try to install same mods as you have and look into it. kds71 wrote: Hm perhaps there is a conflict with some other mod, you have plenty of them. I will try to install same mods as you have and look into it. Well, yeah, I also have trouble wiring smart inserters, so mod conflict seems like the right way to dig. If only I knew how to debug it. Short of enabling/disabling mods one by one. Edit: smart inserters (not) wiring is an acknowledged bug in 5dim. No luck there. Tried unloading mods one by one - no effect. Tried instead loading mods in vanilla singleplayer save - got all buttons. I would really like it if it didn't pick up the items on the belts, that breaks the mod for me since i don't want all of the items on my belts in storage chests everywhere, even if it is a one-time thing. I would appreciate an option to not take the items from the belts.